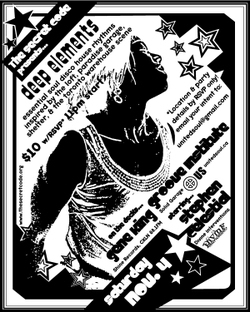 Deep Elements Returns > Studio Loft Party! essential dance rhythms inspired by the loft, paradise garage, the shelter & the toronto warehouse scene! *location details by RSVP only! The United Soul family keeps on growing ... we thank our 2 new myspace members for giving US our monthly dose! Our guests Dj's have been supporting & promoting soulful dance music for some time now. Check out the music links and learn more ... you will NOT be dissapointed!! !